You drive from the Citymarina in the direction of Schöneweide (south-southeast) along the Spree, past the island of Bullenbruch, the BVG ferry Baumschulenweg and the Britzer connecting canal. Now you continue under the Stubenrauch bridge past the Spreehöfen and unter´m Kaisersteg. After passing the former Kabelwerk Oberspree (KwO), you will see the Kranhauscafé on your left and continue along the Spree in the direction of Wuhlheide. Now drive past the Wuhle and the Müggelspree junction and turn right into Dahme. Now you only have to cross one bridge and you will see Köpenick Castle on your left. Continue south along Dahme past Rohrwallinsel and the regatta course on Langen See, Großer and Kleiner Rohrwallinsel and then turn left into Großer Krampe. There are several small bays where you can anchor and swim. After the bathing break we return to the Citymarina. On the way back there is the possibility to take a small detour. To do this, turn left into the Teltowkanal before the Rohrwallinsel, follow it to Britzer Hafen and then turn right onto the Britzer Verbindungskanal, which in turn flows into the Spree just before the island of Bullenbruch and takes you back to the Citymarina. Please allow an additional 20 minutes for briefing and transfer of the boats. This tour is available for following boats. Up to 12 persons can be driven without a licence or 13 persons incl. one of our skippers. 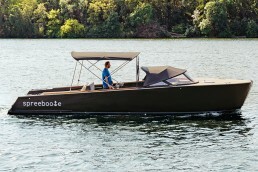 The new Coco is licence free and has a bow thruster. It seats 9 people. The fee is free to drive. It can accommodate up to 12 people. The Hedi is free to drive. It can accommodate up to 8 people. Jade is free to drive and has also on the Müggelsee free ride. The Leo is free to drive. It can accommodate up to 8 people. 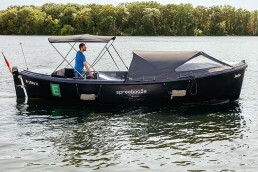 Pina ist ein Sloep für bis zu 11 Personen und gut für Tagesausflüge auf dem Müggelsee geeignet. The Leo is free to drive. It can accommodate up to 12 people.